One of the jewels in Rhode Island’s marine crown is the Rhode Island Ocean Special Area Management Plan (SAMP), a ground-breaking, standard-setting and nationally lauded approach to ocean management with a focus on renewable energy. Faced with increasing pressure on ocean resources from offshore energy, aquaculture, liquefied gas, resource extraction and shipping traffic, Rhode Island officials realized they needed a way balance environmental protections with economic development in order to better manage ocean resources. 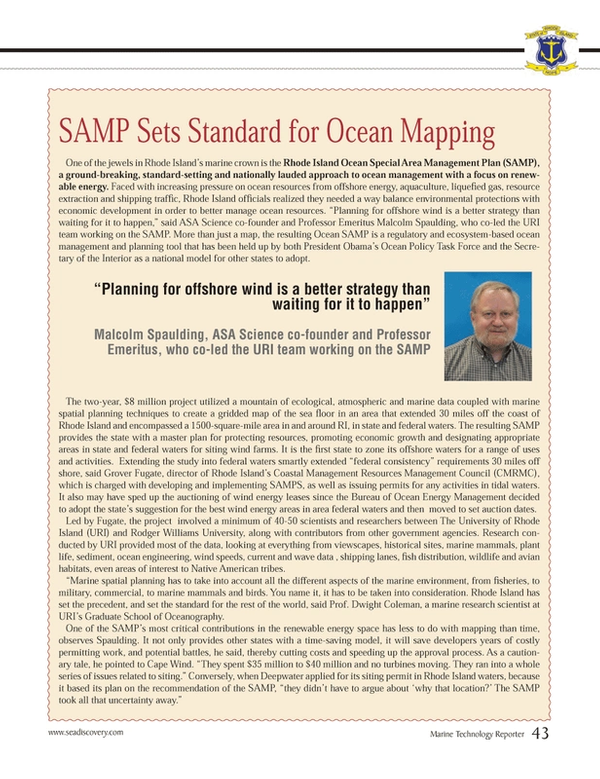 “Planning for offshore wind is a better strategy than waiting for it to happen,” said ASA Science co-founder and Professor Emeritus Malcolm Spaulding, who co-led the URI team working on the SAMP. More than just a map, the resulting Ocean SAMP is a regulatory and ecosystem-based ocean management and planning tool that has been held up by both President Obama’s Ocean Policy Task Force and the Secretary of the Interior as a national model for other states to adopt. The two-year, $8 million project utilized a mountain of ecological, atmospheric and marine data coupled with marine spatial planning techniques to create a gridded map of the sea floor in an area that extended 30 miles off the coast of Rhode Island and encompassed a 1500-square-mile area in and around RI, in state and federal waters. The resulting SAMP provides the state with a master plan for protecting resources, promoting economic growth and designating appropriate areas in state and federal waters for siting wind farms. It is the first state to zone its offshore waters for a range of uses and activities. Extending the study into federal waters smartly extended “federal consistency” requirements 30 miles off shore, said Grover Fugate, director of Rhode Island’s Coastal Management Resources Management Council (CMRMC), which is charged with developing and implementing SAMPS, as well as issuing permits for any activities in tidal waters. It also may have sped up the auctioning of wind energy leases since the Bureau of Ocean Energy Management decided to adopt the state’s suggestion for the best wind energy areas in area federal waters and then moved to set auction dates. Led by Fugate, the project involved a minimum of 40-50 scientists and researchers between The University of Rhode Island (URI) and Rodger Williams University, along with contributors from other government agencies. Research conducted by URI provided most of the data, looking at everything from viewscapes, historical sites, marine mammals, plant life, sediment, ocean engineering, wind speeds, current and wave data , shipping lanes, fish distribution, wildlife and avian habitats, even areas of interest to Native American tribes. “Marine spatial planning has to take into account all the different aspects of the marine environment, from fisheries, to military, commercial, to marine mammals and birds. You name it, it has to be taken into consideration. Rhode Island has set the precedent, and set the standard for the rest of the world, said Prof. Dwight Coleman, a marine research scientist at URI’s Graduate School of Oceanography.